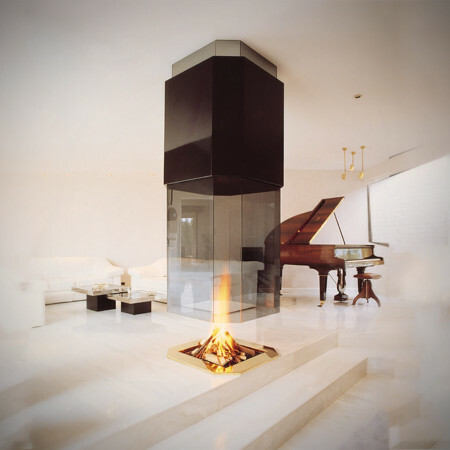 A unique and bold central fireplace with a suspended canopy that incorporates 16 pieces of glass dramatically hung from the ceiling. The beauty of this hanging fireplace design that incorporates glass is that it provides a wonderful focal feature in any living space as well as maintaining light flow. 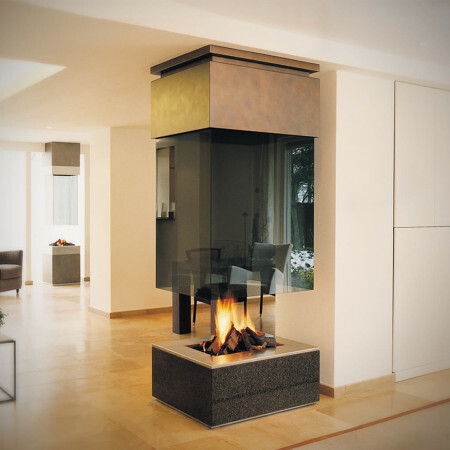 The flickering flames dance around the glass providing a cosy warmth and with the remote control option, the push of the button can alter the flame height. This is a true designer fireplace that is uniquely designed and customised to style and taste of the client. Speak to a design consultant to see how a central fireplace could be incorporated into your project.